The Sunburst Award jury has selected its shortlist for the 2015 awards. The winners will be announced in the fall. 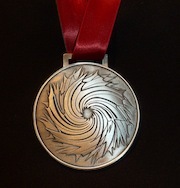 Sunburst Award winners receive a cash prize of $1,000 as well as a medallion which incorporates the Sunburst logo. The jurors for the 2015 award are S.M. Beiko, Gerard Collins, Paula Johanson, Corey Redekop and Sherryl Vint. Was Gibson’s The Peripheral not eligible? That was a fine novel.